We’re overwhelmed with the feedback we’ve got from our customers. We’re pushing features out and seeing people react to it faster than ever. Our goal is to make a minimal and extremely easy to use feedback platform for both companies and their end users to keep them informed. We did a small launch to a closed group of customers last month, and the feedback has been greater than we expected. Simplicity comes with consistent updates. As a product focusing on flawless handling of customer feedbacks, we wanted to let the customers be updated about their feedback’s status. As soon as the customer’s feedback is moved to planning stage or development stage, we will let the customer know. Similarly, the organization’s admin will also get updated about every single interaction happening in their organization’s product. Updates are happening through beautifully designed emails. And our team is working on providing browser notification because our customer’s feedback is very important to us. Please check the below link to understand our next step in keeping everyone updated. A lot of time, single organization handles hundreds of products. Managing them under different logins is tedious and defeats our purpose of “providing simplicity” to our users. Now you can manage different products of yours under the same organization. Not all time, one person can handle everything. We believe in “team-spirit” more than anything. 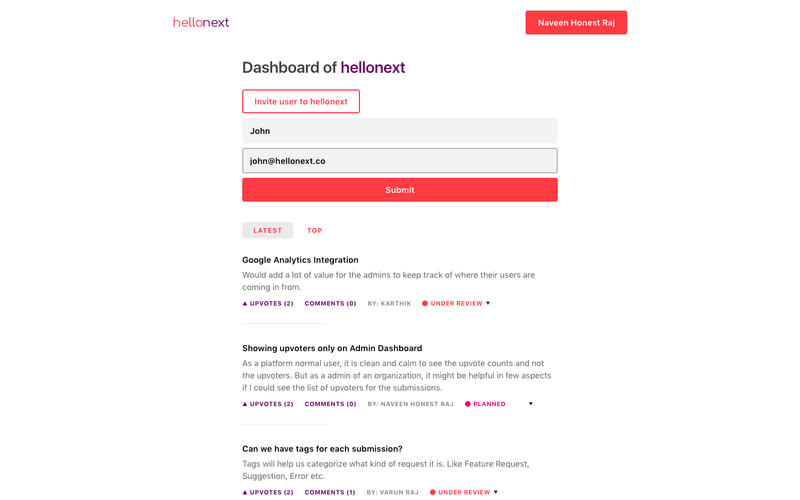 Even hellonext is a wonderful product of such amazing team. Because we stand in our beliefs strongly, we decided to provide our users to invite people to manage the organization “together”. We, every minute thrive to provide the best user-experience without making anything complex. 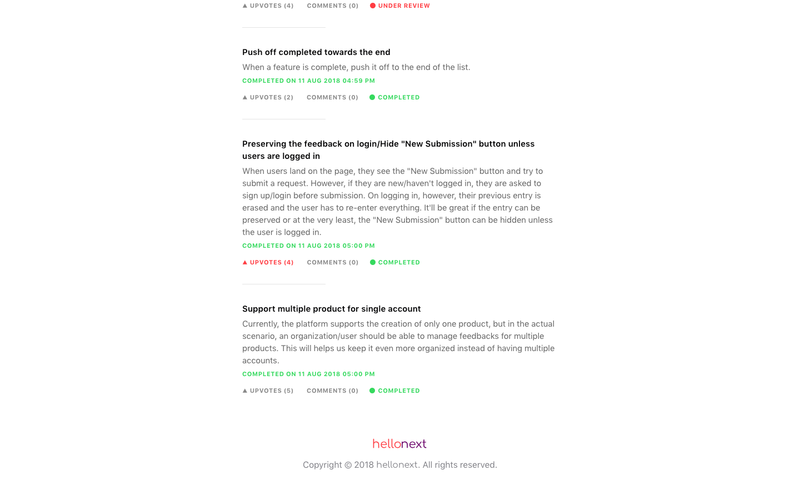 Our users felt that moving the on-going this to user’s first-view and moving the “successfully and amazingly completed ones” down the lanes would help to focus on the needed things. Customer’s feedback is our first priority, right? So we did it, too. 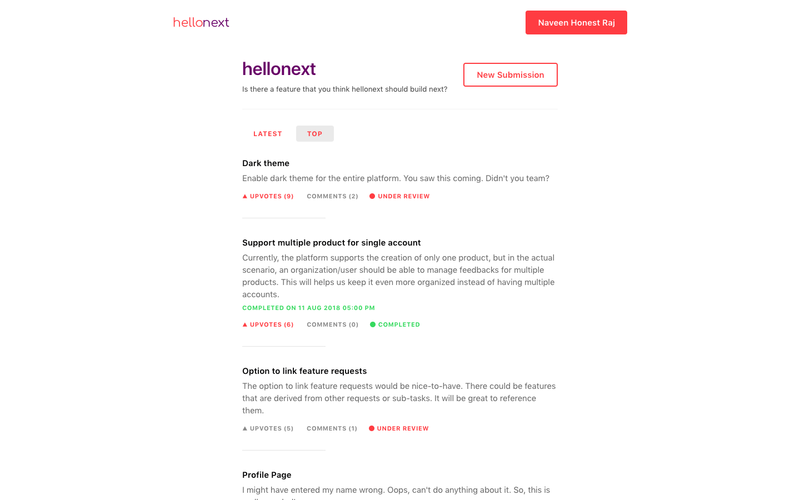 We are working on some of the features like Dark mode, markdown support for comments and more. You can also go vote for it, if you really wanted the dark theme to be delivered first.